BERLIN (Sputnik) - German Defense Ministry spokesman Jens Flosdorff said on Monday that he was "not willing to speculate" about the possibility of Germany joining Western strikes against the Syrian government. "I do not want to speculate, many media [outlets] have reported about such a possibility. But all this is tied to a specific situation… We have not reached this point so far," Flosdorff told a briefing. German government spokesman Steffen Seibert, also present at the briefing, said that "the government was in contact with its partners and allies on the situation in Syria's Idlib," stressing that the involvement of the country's armed forces in a military operation must be approved by the parliament. At the same time, leader of the Social Democratic Party of Germany (SPD) Andrea Nahles rejected German involvement in the possible strikes. "Andrea #Nahles: The SPD will not agree with Germany's involvement in a military strike in Syria," Nahles said as the party tweeted. The SPD faction in the Bundestag also expressed their rejection of the possible participation in the military campaign. "Participation in the war in Syria is out of the question for us. We support Foreign ministers @HeikoMaas in his efforts to prevent a humanitarian catastrophe in talks with Turkey and Russia," the faction tweeted. Speaking about potential strikes, Heike Hansel, a member of the Bundestag from the Die Linke party, told Sputnik Monday that it would cause a dangerous escalation of the situation in the war-torn country that is attempting to undergo conflict settlement. 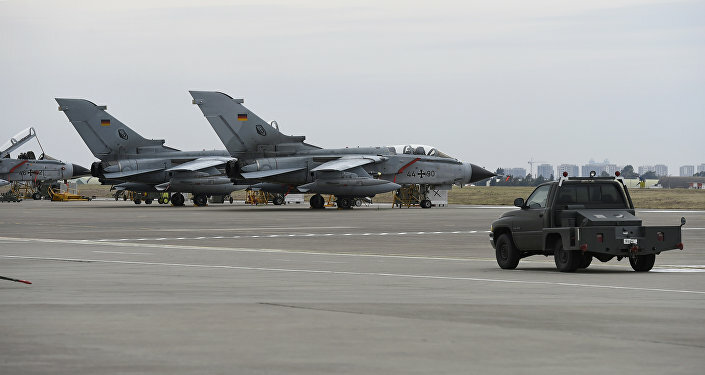 "An involvement of Bundeswehr in military strikes in Syria would provoke another dangerous escalation… This is a breach of international law by NATO members, because there is no UN mandate for this. Germany should not participate," Hansel said. She also criticized the Western narrative of chemical incidents in Syria, stressing that there was scarce evidence that the Syrian government was behind the Douma attack in April which prompted the previous airstrike against Syria by the United States, France, and the United Kingdom. Damascus, as well as Moscow at the time, refuted the allegations of Damascus being behind the Douma incident, saying that the attack was plotted by militants to discredit the government. "Moreover, the justification for a possible German involvement in military strikes in Syria if a 'demonstrable' use of poison gas by the Syrian army can be proven is appalling, as even the Organization for the Prohibition of Chemical Weapons, OPCW, has not been able to establish a retrospective responsibility for chemical weapons operations in the Syrian Duma attack," the lawmaker said. The comments referred to the publication by The Bild newspaper, which had reported that the German Defense Ministry was mulling the possibility of joining potential US, UK and French strikes on Syria in case of a chemical weapons attack. The report followed the warning by the Russian Defense Ministry, made in late August. saying that terrorists of the Tahrir al-Sham group* were preparing a false-flag attack in Idlib to later accuse Damascus of using chemical weapons. Earlier this year, in April, Syrian opposition, as well as Western states, accused Damascus of being responsible for an alleged chemical weapons attack in the city of Duma, which led to a series of missile strikes by the United States, the United Kingdom and France on Syria. Damascus, as well as Moscow, refuted the allegations saying that the attack was plotted by militants to discredit the government troops.